So at my recent school, the department were extremely passionate about entry activities. These were starters that were given as students entered the room, so that they immediately had something to focus on. 1. Must be printed - So that each student has something in their hand, and avoids situations where students have to keep looking up to the IWB. 2. Must have opportunity to write their name - no matter how poor the student's ability, most can fill in a name, therefore they can all be getting on straight away. 4. Should not have an end - This was tricky for me - there should never be a point where the student has finished their entry. 5. It must be worthwhile - Students won't buy into it if the teacher just bins the work later in the lesson. At first, I was creating differentiated, thought provoking (yet easy), printable entries, for the start of all my lessons. It took me about 45 minutes to create each one, and we used it for 5 minutes a lesson. It was painful. After many attempts, and poor ideas, I finally landed on one I liked. I call it my ACE entry. Each entry follows a similar pattern, answering easy questions (based on the class ability, I had ones that ranged from addition to factorising quadratics) followed by a matching activity, which helped students who liked to self check. When going through this, I quickly reeled off answers, or went round the room asking for answers. If anyone tried the "didn't get to it", I simply asked them to work it out then and came back to them in a few more questions. Then the communicate question, which encouraged the student to communicate effectively certain definitions, or explain where a misconception has occurred. An example being "Explain why 3.4 x 10 is not 3.40"
T: why is it 34? S2: because the numbers moved to the left. T: What did they do wrong? S3: added a zero instead. T: Why did they do that? Finally, the extension, which I rarely mark in lesson, but mark when looking in books. I get them to stick the A5 sheet in their books and give feedback about it. If a student is not getting enough done at the start of the lesson, I ask them to complete it as part of homework. I also value it with praise stickers that just highlight completing the entry to a high standard. Now, there are 63 of them in this zipped file, enough to last you till Christmas at least. Only a few have repeated parts, and some are harder than others. Each one is duplicated so you can print two on one sheet easily from the print menu. Warning - I will have made mistakes on these, having made them generally between the hours of 11pm and 1am. Which leads me to my second point. 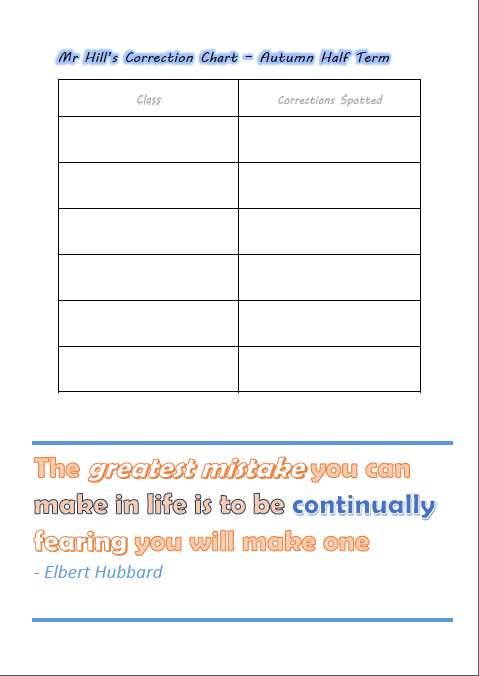 When I started teaching, one of my irrational fears was that I'd make too many mistakes on the board, as I am quite clumsy sometimes with my working. To combat it - I faced it full on, and created Mr. Hill's Correction chart. I make the joke that through the year I will put in mistakes, and if they can spot them then they get a point for their class (of course I never do it on purpose). I display this poster proudly on the wall. I also explain how it is fine to make mistakes and that is how we learn. My student's love catching me out and you will often hear in the middle of my class "correction!" from an over zealous student. So embrace the many errors there may be on these entries! Thank you for sharing these fabulous worksheets.